Production Facility: We have a fully state-of-art production facility in Pune for Weighing scales and Truck Weighbridges. Existing we have a production staff of around 75 people and other staff is around 50 people for admin, sales, and accounts. Our registered office is located in Pune from where all sales, order processing, after sales service happens. R&D also takes place at HO in Pune. Our Pune manufacturing unit has a production team of 35 people including production engineers, quality control engineers and skilled laborers and an additional in-house fabrication unit for speedy and quality fabrication of platform as well as weighbridge structure. Sansui Sales and Service: After-sales service of is been offered by Sansui sales and service through its staff of more than 80 service engineers deputed all over the country, 8 branches, 4 regional service Managers along with support staff of 15 people. They undertake within warranty service, Annual Maintenance contracts of weighing scales and weighbridges, warranty service for parameters, and dealer support for spares and dealer service. The Service Department has 3 Service technicians exclusively for parameters in Hyderabad, 1 in Chennai and providing services from Kottayam Service Branch for the entire state of Kerala. Presently they have a turnover of 1.6 crores and project would be around 1.8 to 2 crores. Meters need to recalibrate now & then whenever there is a change of Tariff. For changing this tariff and getting the bench Test and Road Test done, most of the State Govt., Require Technical Staff of ITI Electronics to give them a Skill Certificate or License above to do the same. Since we have our own Service Engineers they are responsible to do the same. 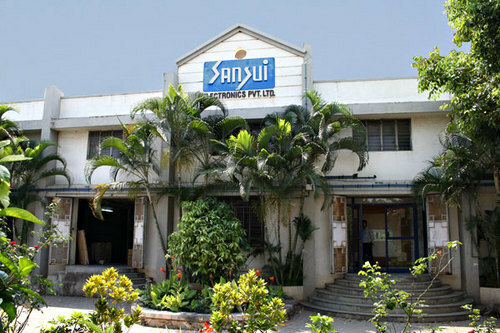 Sansui Electronics, Parwanoo: This unit located at Parwanoo in HP. Has a factory area of around 10000 sqft., and production staff of around 50 to 55 people. We manufacture Tabletops, platforms, heavy duty platform scale and jewelry balances. Apart from these weighing balances, the unit is fully engaged in the manufacturing of electronic auto/taxi fare meters for the needs of different states of the country. A General manager stationed at Parwanoo to handles this unit. They did the Turnover of approximately 14 crores in the last financial year. This unit is now in its fifth year of its operation.